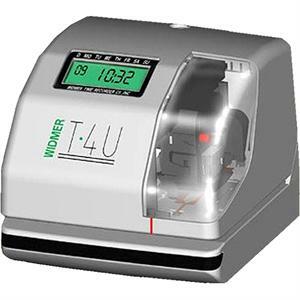 The T-4U electronic time clock can be used to support time and attendance, job costing, and document control and offers both value and features all in one reliable machine. LCD display indicates Date, Time and Day of Week. Two selectable hour formats (12 or 24) and choice of standard minutes, tenths, or hundredths available. Choice of printing 2 or 4 digit year when included with print configuration. Dimensions: 5.70" x 6.45" x 6.75"